A powerful and flexible alternative to the MacBook Pro that’s available in two sizes – 13.5 and 15-inch. Still an astounding screen and unique design, the Surface Book 2 is a winner in every respect – providing you want a tablet as well as a laptop and providing you’re happy using Windows instead of macOS. The second generation of Microsoft’s Surface Book family has a key difference to the first – it’s available in a 15-inch size as well as the original 13.5-inch version. The pair of laptops – first announced in October 2017 – are still going strong and we don’t expect them to be replaced until October 2019. They remain genuinely powerful alternatives to the MacBook Pro line. Certainly, Microsoft didn’t do anything with the Surface Book lineup during its hardware refresh this year, instead announcing Surface Laptop 2 and Surface Pro 6 for the UK. A new Surface Studio 2 was also announced for the US, but that isn’t available in the UK for now. 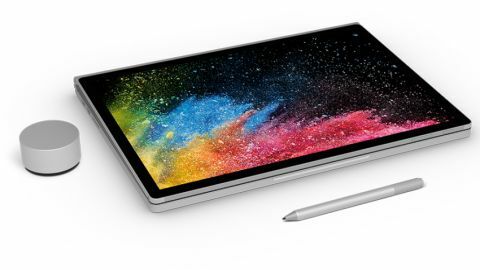 The Surface Book 2 is a little different than a traditional clamshell because it has a party trick for creatives; the entire screen is detachable, so it can be used with the Surface Pen for artwork, note-taking, annotating and much more. In a sense, it takes the concept of a convertible laptop as far as it can go. We’ll discuss price in more detail shortly, but one thing the Surface Book 2 isn’t is cheap. It has premium pricing to reflect its high-end specs. Surface Book 2 slots in above the 2-in-1 Surface Pro and ultraportable Surface Laptop (which is a traditional clamshell) in Microsoft’s Surface line-up. In a sense, the cheaper Surface Laptop has freed Surface Book 2 from having to be Microsoft’s premium laptop offering. Because Surface Book 2 is so much more than a mere laptop; it is designed as a do-anything machine with both ultimate versatility and swashbuckling power. Everything about Surface Book 2 has been designed to showcase the very best of Windows. If you don’t think you will have a use for the tablet portion of Surface Book 2, then take a look at Surface Laptop (or, indeed, the equivalent 13 or 15-inch MacBook Pro). If you’re not going to use it, even with the best Black Friday deal you’ll be paying dear for something you simply won’t need. Sadly Surface Pen doesn’t come bundled with the Surface Book, so you’ll need to shell out an extra $99/£99 for that. It’s crazy that it isn’t bundled at this price, but all the well-known stylii from Microsoft, Apple and Google are all optional extras so it’s not as if Microsoft is unusual here. Now, neither of these laptops are super thin or light (the 13.5-inch version starts at around 1.5kg, for example), so if supreme portability is your thing then look elsewhere. The weight has decreased since the original Surface Book – which weighed in at around 2kg - one of the key differences between the old and new models. If you’re thinking of getting the 15-inch version, we’d recommend checking it out in a store first as the tablet seems huge in the hand and you ought to make sure it’s really what you want. It is, however, simply fantastic sketching on it with the Surface Pen. The 13.5-inch version measures 312mm x 232mm x 13mm (at its thinnest part) and is slightly thinner than its predecessor. But it still feels bulky compared to many thin and light laptops and the super-thin MacBook Pro. But while the MacBook Pro is uniform throughout, the Surface Book 2’s whopping 'fulcrum hinge' means it's much thicker at that point. This does mean it can be a pain to fit it into some laptop bags, even if the bag is designed to take laptops with that particular screen size. However, the hinge does enable tremendous flexibility since you can poise the display at any angle. You can even attach the screen backwards using the keyboard part as a stand, for example for a presentation or to watch video content. The screen detaches with a satisfying click and is activated via a key on the keyboard or taskbar button. Another major difference is that the basic version of the laptop – the Core i5 version - now features fanless cooling for quiet operation. However, the lack of dedicated graphics means this isn't perhaps the best version for designers. The Core i7 versions, including each of the 15-inch variants, still need fans due to the greater power consumption. Microsoft has made no secret of the fact it is targeting creatives who have been traditional Apple customers. There’s no doubt that as far as touchscreens and styluses go, Apple has put all its eggs in the iPad Pro basket - and a mighty fine job it’s doing there, too – the latest 2018 iPad Pro is a dream compared to tablet rivals. But the fact remains that however much Apple pitches the iPad Pro as a computer, it just isn’t a Mac running full-fat desktop apps. And, of course, full-fat desktop apps also happens to be what Windows 10 does rather well. Windows 10 is a very good operating system. 'The best Windows yet' is a cliché, but it also happens to be true - it’s robust and flexible. The Microsoft Store remains a problem, however. There still aren’t enough decent native apps and everything feels half a decade out of date. It’s just as well that Windows is so well supported by traditional desktop apps. Windows 10 in Tablet Mode isn’t as intuitive as iOS on the iPad and iPad Pro, but it is a decent compromise between a traditional desktop experience and using a tablet and pen. You can choose whether Windows 10’s Tablet Mode invokes automatically when you detach the tablet; it’s a simpler interface designed for touch and pen. The tablet part runs on integrated Intel graphics, but when you dock it back into the keyboard slice things get a power up with extra battery life and immense discrete Nvidia graphics power (depending on which model you buy). If you detach while using a graphics-intensive app, you will be warned that performance could be affected. As we mentioned, Surface Book 2 is a high-end offering and has a price tag to match. The base-level Surface Book 2 13.5-inch model gives you a 7th Generation Intel Core i5 CPU, 8GB RAM, 256GB and integrated GPU for £1,499 (or $1,499 USD, around AU$2,600). If you’re thinking that price point isn’t so bad, you’d be right. Unfortunately, that version doesn’t include the dedicated Nvidia graphics that we bet you’ll need. For the next level up, you need to hand over a not-inconsiderable $500 more. You’ll get an Nvidia GTX 1050 GPU with 2GB GDDR5 memory for $1,999 or £1,999 (around AU$3,400). Further up, the Intel Core i7, 16GB RAM, 512GB SSD and Nvidia GTX 1050 GPU configuration costs £2,499 or $2,499 (around AU$4,300). Finally, the top specification features Intel Core i7, 16GB RAM, 1TB SSD and GTX 1050 for £2,999 or $2,999 (around AU$5,200). The available Surface Book 2 15-inch models are: Intel Core i7, 16GB memory, 512GB storage, dedicated Nvidia graphics for £2,749 or $2,899, or with 1TB of storage for £3,149 or $3,299. Wowee. Coincidentally, there’s also a 256GB version of the 15-inch for $2,499 in the US. If you’re considering the Surface Precision Mouse, it’s a great option but it is expensive at £99/$99 and other mice – like Logitech’s Master 2S – are similarly priced and offer just as much (see our guide to the best mouse of 2018 for more information). Microsoft’s mouse does offer Bluetooth and wired connections for ultimate flexibility. The 3,000 x 2,000 267ppi PixelSense screen looks super thanks to a 1600:1 contrast ratio that makes colours really pop. The 3:2 aspect ratio won’t be to everyone’s liking, but it does mean you can comfortably work on side-by-side documents, which you don’t get with the 16:9 screens on many ultraportables. Using Surface Pen is a joy (it’s great using the features of Windows Ink to mark up documents) and we prefer the design of it to the Apple Pencil, which is too glossy and slippy for our liking. Those used to drawing with a Wacom tablet will find no issue in adapting. We’ve used the Surface Dial accessory a few times and, while it’s certainly more suited to Surface Studio, it can be used on Surface Book 2, of course. We do feel it’s more geared to those using a computer for long periods at a desk; if you do that using a Surface Book 2, you’d probably plug it into an external display. Talking of performance, it isn’t an issue for any model of the Surface Book 2 with the dedicated Nvidia graphics; they simply have too much on offer in terms of processor power and graphical prowess. You’ll get several hours of standard use out of the tablet part of the Surface Book 2 (so, maybe enough for a morning). You're also able to charge it separately to the main keyboard dock, and there's an extra battery housed in the keyboard base. In terms of overall battery life, Microsoft cites 17 hours. That’s a bit too high in our experience, but we’ve certainly achieved 12-hour intensive days. If you’re only using documents, for example, you’ll be looking at more than that. Microsoft’s Surface keyboards have always been some of the best around and that’s reflected here. It’s certainly a lot less clicky than the latest generation of MacBook Pro keyboards, and there’s plenty of key travel. The trackpad is also smooth and responsive. Unlike the original Surface Book, Microsoft has finally given us USB-C on the side of the laptop, even if it hasn’t gone cold turkey on USB-A like Apple; there are still two older ports as well. There’s also an increasingly-rare full-size SD card reader, which is great for photographers. If you want a productivity powerhouse AND an excellent tablet/pen experience then you can do no better than Surface Book 2 in a single device. It’s a fantastically well-designed, premium notebook that’s great for creatives. But it’s not the right option if you want just a traditional clamshell laptop.